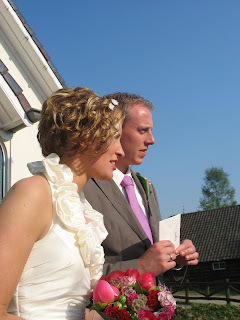 Our cousin Marinke van Herksen got married in the Netherlands this weekend to Evert (our newest cousin). We really wish we could have been there, but with our upcoming trip to Europe in just a couple of weeks it wasn't going to be possible, but we want to wish them the very best and send them lots of love from Maputo. We hope you have a wonderful honeymoon in Bali...we are so jealous! Thank you Anniek for sending us these photos. Marinke you look beautiful! And we will see both of you in Holland in a few weeks! 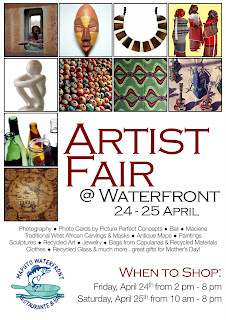 This weekend Picture Perfect Concepts (Paty and I) are selling photo cards and prints at a local Artist Fair in Maputo. Yesterday went pretty well. I sold two prints and a dozen card sets or so. Hopefully today the traffic will pick-up and we will sell out of our cards...okay, that might not happen but a girl can dream, right? Above is the flyer I created for the event. If you are in Maputo I hope you can make it...if you are not, then you can visit our website here to see all the card sets we have for sale. Happy 32nd Birthday Baby! 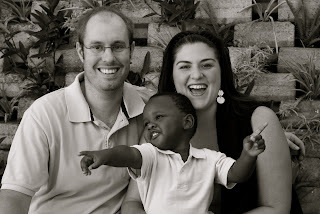 Who would have thought when we first met on match.com that we would be celebrating your 32nd Birthday in Maputo. I hope that you have a great day today and that you get your special birthday wish. I hope that our life continues to be an adventure and that the three of us never forget how lucky we are to have eachother...no matter where we are. 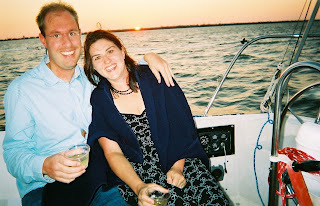 Flashback....Ahhhh.....look at us the day you proposed in Captiva.....we look so young....lets see...you were almost 28 in that photo....how time flies! Oh, in addition to the birthday gifts you got this morning, here is another one: no matter what birthday you are celebrating you will ALWAYS be younger than your wifey! 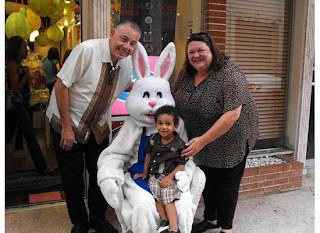 Here are my parents and Maxwell (my nephew) visiting the Easter Bunny in Coral Gables, Florida. The only people missing from the photo are Moqui (my sister) and Wole. Monica, I want to see that baby bump! I was recently inspired by this idea that I saw on one of my favorite blogs. I put my own little spin on it and after a day of taking photos and a few hours on Shutterfly...Luka's Favorite Things was born. This book chronicles (in three languages) Luka's favorite objects, toys, food and activities at this moment in time. It uses Luka's own items to tell the story. Now Luka has a book where he will recognize all the characters and hopefully treasure it for many years to come. The good thing about shuttefly is that if he trashes it (I am sure after a couple of months the book will be a mess) I can always order a new one. The whole project took about 8 hours and cost only $35 USD. I went for the expensive cover and added 9 extra pages...but if I would have stuck with the soft cover and 20 pages this project would have only cost be $16 USD (with the 20% & free shipping coupon I had). Either way a great bargain! Luka doesn't want anyone touching his eggs! Our Family on Easter Sunday in our backyard. We hope you have a wonderful Easter holiday and enjoy time with family and loved ones. 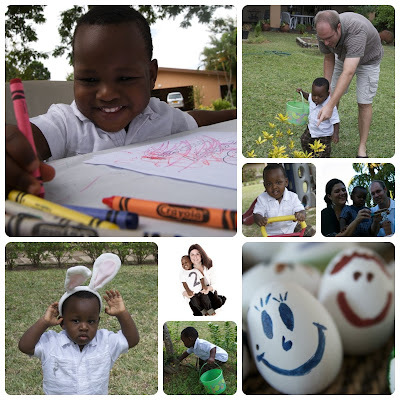 Here are some photos of Luka having fun at the Easter Egg Hunt yesterday and some other recent photos of our family. 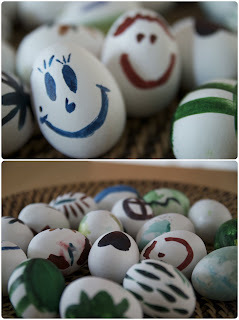 For more Easter photographs click here. Easter eggs were very important in my house. 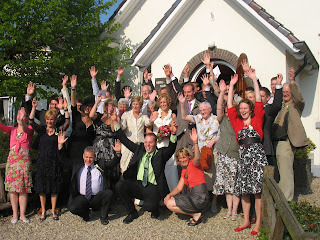 It was a tradition that the Vigues family always participated in. I think my sister and I were still participating in Easter Eggs Hunts (just the two of us) until the age of about 25. My parents would hide the eggs around the house and the yard and my sister and I would compete. As we got older the stakes got higher. I think last time we did it...it was like $1 USD per egg (clearly before any type of recession). Go mom and dad with the cool prize for the eggs! But prizes aside, painting the easter eggs was always the best. I remember all the cool colors and some of the different Paas kits that would come out every year. Do you remember those plastic sleeves that you would boil with the eggs and them you would have a plastic design on your egg? Or that really cool metal dipper that would come in the kits so you could drop the egg in the colored water. Anyway I could go on, but this was something that I wanted to continue with Luka...not the money...just the painting and the egg hunt. Well there is no Paas kit in site in Maputo so I had to get creative. We don't even have white eggs. 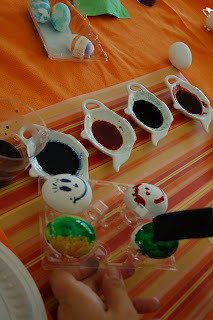 So I bought some white candy eggs with chocolate inside and some food coloring...well I couldn't drop the egg in colored water because the sugar would come right off (I tried it)....so I just used concentrated food coloring to paint on the eggs with one of my make-up brushes. I am telling you I was so short of supplies! Well here is the result of our hardwork (my friend Paty and her son Max joined us). The painting session really didn't last long. Luka thought it would be more fun to pull the table cloth out from under us...literally. So Paty and I finished painting the eggs as the boys rode their little plastic bikes, which they seemed to enjoy more than any silly eggs. But I will still keep trying this "tradition" with Luka and I enjoyed myself very much and with every paint stroke I thought of my sister. This is one of her favorite holiday activities ever and she was always the one that made sure we did it. So Moqui, these eggs are for you. I miss you! Thank you Michael B. for this video from Luka's Birthday Party. You can see how Luka was "challenged" by one of the dancers at the party...how do you think he will react? Hi, this is Luka. Just in case you were wondering how I learned to type...well I haven't. I asked mami to type this letter for me. For some reason I can't use my crayons on a "blob." What the heck is a blob anyway..oh, wait mami says it is called a BLOG...whatever. Blob sounds better to me! The other day we were talking on Skype (gotta love the internet) and I told you how much I loved "bubberflies." I love coloring them, drawing them (with mami & papi's help), chasing them and seeing them on tv. It is one of the words I say the most and every time I see one no matter how tiny..I always find it. Well I loved it and I colored it for you. I hope you like it. 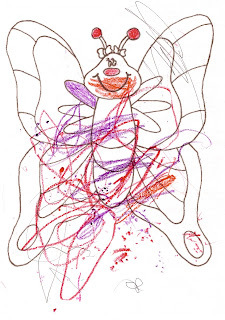 I still haven't gotten the whole coloring in the lines thing...but I call this piece "Modern Art Bubberfly." I miss you and keep sending me bubberflies in emails. I also love fishees and dolphins! Luka Loves to Eat Chips! No matter how hard we try to feed Luka solids he just doesn't like it. We have tried veggies, fruits, chicken nuggets, pizza, bread, etc. Basically Luka likes all his food mushy except for cookies and chips. Here you can see him enjoying his favorite guilty pleasure...potato chips. 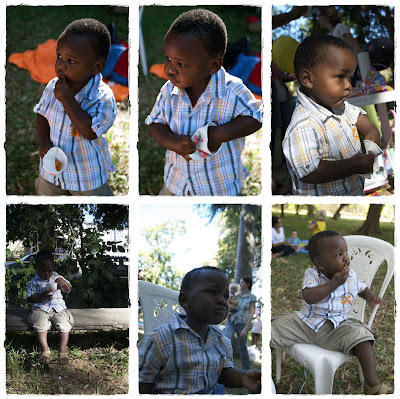 Please note that all these photos were taken at different times in the party....I kept telling him he couldn't have any more chips and then he would sneak off. I had my camera with me that day so I have the evidence! He becomes a little possesed when he sees a bowl of chips...think cookie monster meets Luka....he stuffs as much as he can in his mouth and it doesn't matter what the flavor. For him the spicier the better. We have had to ban chips from our house...can anyone give us ideas on how to get the boy to eat a carrot stick? Okay, so I am not sure if my "timeout" strategy is working with Luka. Today he was lining up his Little People and saying "Little People Timeout." 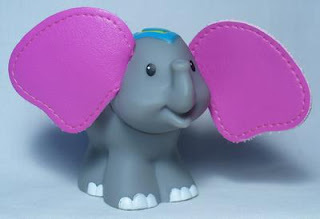 Then the poor elephant got it the worst. He kept saying,"Little People Elephant You TIMEOUT." I don't even put him in timeout that much. I think he thinks it is something fun. I think I must have missed the Super Nanny episode that spoke about this. He is two. Should I be putting him in timeouts? Am I scarring him for life? He might be taking his frustrations out on the poor Little People. Hmmmmmmm. 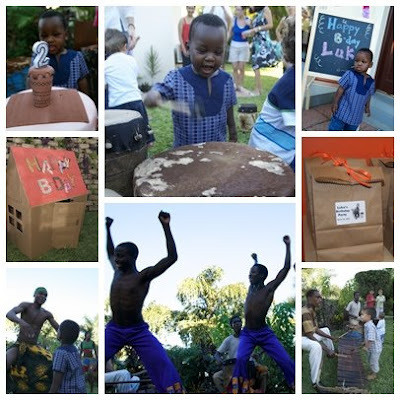 Last week was Luka's Party and everyone had a good time. But to tell you the truth I was running around the entire time and it is not until now that I can sit back and appreciate the event. It had been a very bad week for our family. We were thinking about not having the party, but then we thought of Luka and we thought the party must go on. The cake....how lucky was I for Luka to mess up the cake of little boy the day we visited the Montessori school. Yes, he totally trashed the cake before the boy even blew out the candles. I didn't know these people and we were just visiting the school. Que pena! I was mortified. But the mom was so nice and I asked her where she got the cake. A Brazilian guy named Divino...translated means divine! Pretty fitting considering the outcome of the cake. So that is the story of the cake..and it was so freaking delicious...the inside was more like a brownie than a cake. The Party Bags...Why do I always obsess about the party bags? Have you seen what kids do to them 2.5 seconds after you give it to them? I mean the minute I pass them out they are destroyed! But even knowing that I think I will always obsess about these silly things...what OCD mom wouldn't. I just used brown paper bags and slapped a label on it with Luka's photo. Thank goodness for Avery Labels. I had this idea about making little drums out of colored paper and labeling it with the names of the kids....but there was no time...so Avery Labels it was. Add some ribbon and a star punched hole and viola...party bags. Musical Petting Zoo...okay I am totally stealing this phrase from my friend Wendy that saw the photos of the party. But that is exactly what it was a musical petting zoo. The dance group not only gave a great performance, but their ability to engage and capture the attention of the kids was amazing. Children ranging from age 1 to 30! Everyone was having a great time dancing, banging on the drums and playing the timbila (the big thing that looks like a wooden xylophone). My only regret is that I didn't take more photos. I only have photos of the show and cake cutting...thank goodness for Tia Paty. But mommy should have been more on the ball and taken photos of Luka and all his friends. I think next time I will just hire someone to snap pics. I mean I should know better since people hire me to take pics...silly mami! If you live in Mozambique and want the number of Divino (cake guy) or Milhoro (Dance Group) just send me an email and I will pass it along to you.